Fair Isle sweaters (jumpers) have been on my mind recently. It will take quite some time before I am actually good enough at knitting to make one of these lovelies. 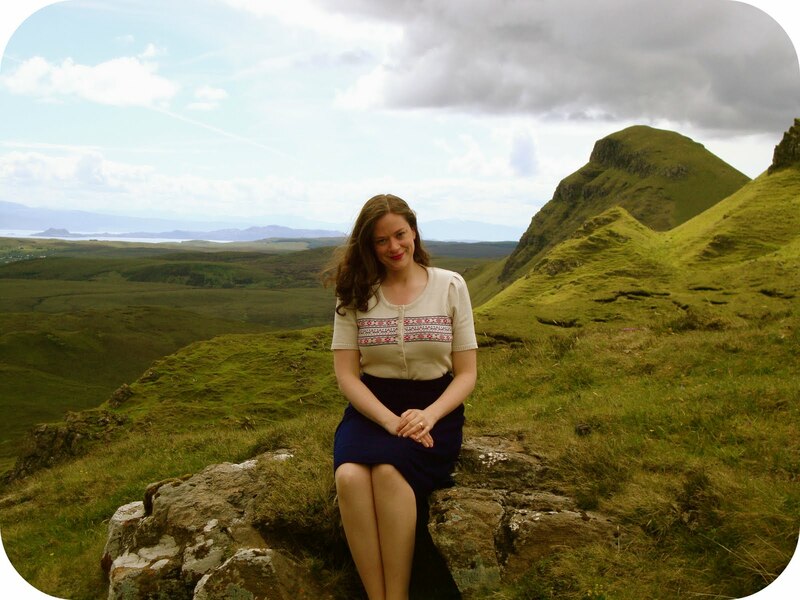 Luckily, Ness has THE perfect vintage inspired Fair Isle sweater! The style is called 'Brooke' and it's part of their 60% off summer sale. 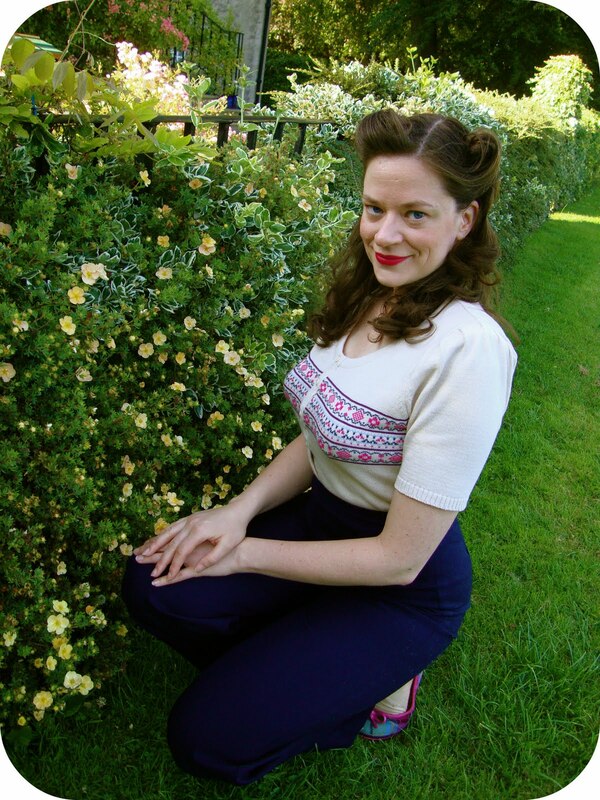 I'm wearing my Ness jumper with my 1940 Navy wool skirt. 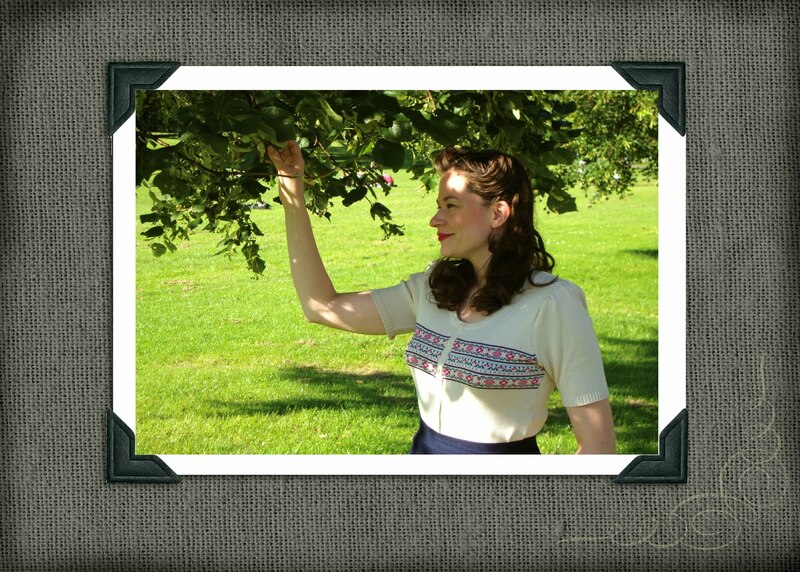 It goes perfectly with my 1941 high-waisted trousers!!! I love this photo so much! You can see the pleated sleevecaps--which is a beautiful 1940's inspired feature. This is definitley going to be a wardrobe staple as it's perfect for all seasons! To give the sweater a more 40's style look, I added shoulder pads. 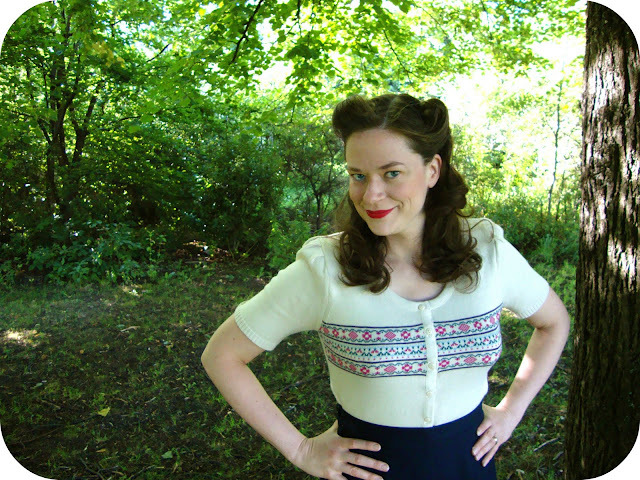 I bought shoulder pads at my local fabric store but used one of my 1940's patterns to cut it into a more 1940's shape. 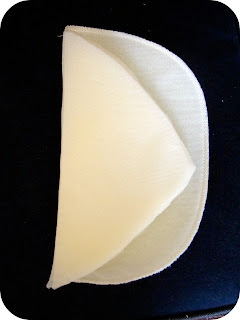 You can see the 40's style shoulder pad on top and the store-bought shape below it. I then covered the shoulder pads in a cream crepe-back satin fabric and attached them to the sweater. It's actually a very subtle difference but I like how it looks (to get an idea of how it looks without shoulder pads, the photos on the Isle of Skye are without shoulder pads). This sweater is also available in mauve and hot pink. Hmm...I may have to get this one! It fits in with both my summer and autumn/winter sewing plans as the colour mauve features prominantly. I find that I wear sweaters quite regularly with my me-made clothes--especially cardigans! 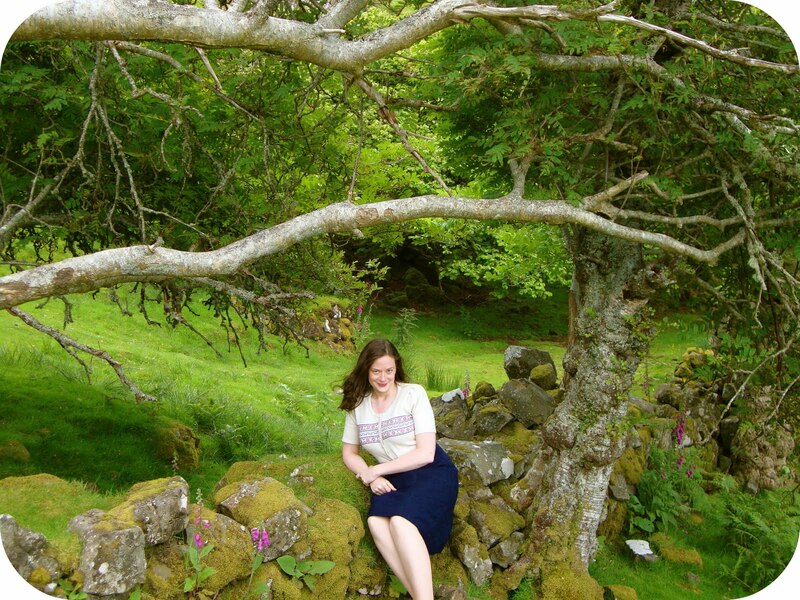 This last photo was taken in an enchanted location on the Isle of Skye called 'Faerie Glen'. Probably one of my favourite place in all of Scotland! It is absolutely stunning!! There's loads of other goodies on sale--definitately worth checking out! Jane from Handmade Jane!!! 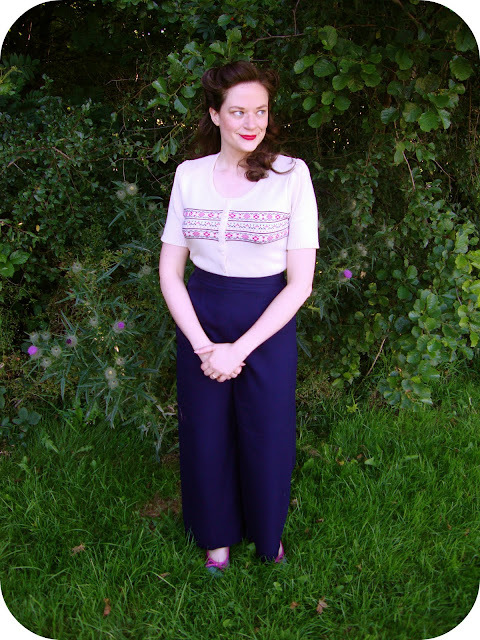 Jane just wrote a great post about how sewing has changed her life (as part of Tilly's research). YAY! Congrats Jane!!! Can't wait to see what you do with this pattern!! Ooooh, it's all stunning, you, the sweater. the thistles and not the least the landscpae. Breathtaking green! I love seeing your photos! You have the most beautiful scenery in the background. Loving that sweater, Deb!!! Good idea to add the shoulder pads too. I tend to shy away from those for every-day wear, but occasionally when I'm really amping up the 40s look, they'd be a welcome addition. :) Congratulations to Jane too for the pattern win!!!! Cute! Especially in the 40s styled photo, you can never go wrong with rolls! Beautiful photos! I have been fascinated with fair isle sweaters since I was a child. It seems like they are reappearing at the moment--yay! And such a perfect place to shoot... Isle of Skye has to be the most mystical, ethereal and green place I have ever visited. These photos are so great and I'm sure there are fairies about in that bottom one as I see hiding places of them. Gorgeous photos. I am so used to removing shoulder pads because they look so big and bulky on me, but this makes me consider that maybe I should be altering them instead. I must admit I do like the way they give those shoulder pleats a bit of a lift. We have been to the Fairy Glen as well, on a MacBackpackers' tour, which was a total hoot. As I recall, this trip also included putting my face into a stream that supposedly was going to bring me eternal life or something. Speaking of Ness - when we were in Glasgow, I DID find them!!! I also lost my nerve when I looked at all the scrumptious things and decided (ahem) that they were all too young for me. Sigh. At the top of my bucket list is a visit to Scotland. I love the sweater. Now that I live in the mountains, I can actually wear sweaters, even wool. I'm so excited. And thank you for following my blog. You make up 50% of my followers. The Isle of Skye has just been added to my places-to-visit list. It's just gorgeous! 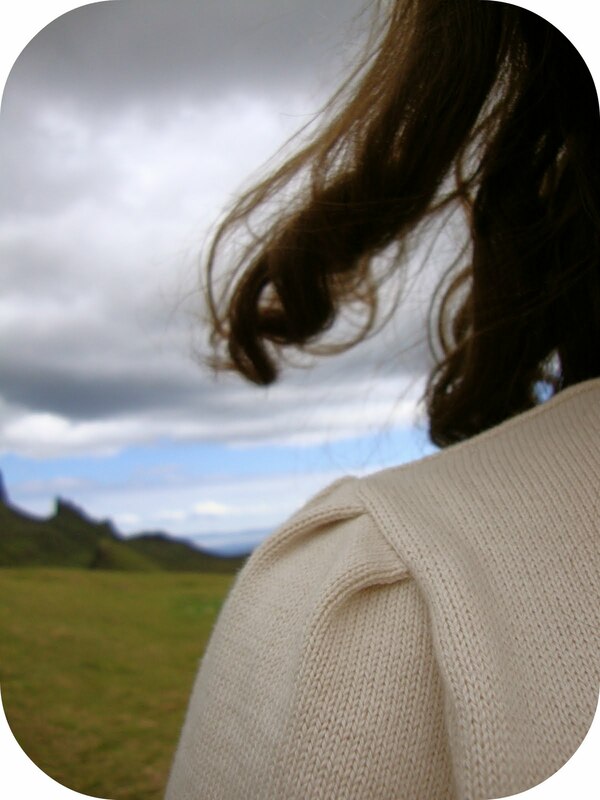 And, I'm glad to see a close up of the pleats on the shoulder. I tried to add pleats to a recent jacket of mine, and it was quite a pain. Then, when the jacket was complete, I wasn't sure that the pleats weren't worth the effort. Seeing how cute the pleats are on your sweater makes me feel good about the whole thing again. So, thank you! I think your cardigan is simply gorgeous and the scenery is beautiful. Wish I could see it. You always have lovely location shots. Visiting Scotland is definitely going on my wish list. What a stunning locale. Amazing pictures. PS - I'm a total cardi addict, too. I love your pictures! In fact, I love all your pictures of Scotland. I'm from Australia, but have been to Scotland many times, so seeing your photos around the Royal Mile, and Skye, along with all your vintage creations, tug the heartstrings. Keep it coming! What a cute sweater. You are lucky to live in such a stunning place.